Description: #2 heads east across the Fox River bridge. Description: #2 heads off the Fox River bridge. Description: #2 heads east to Shops Yard passing the wig-wag. Description: #2's power pulls east through Shops Yard as FRVR's OS1 works their yard. 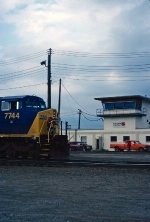 Description: The power off #2 pulls through the yard and past the tower. 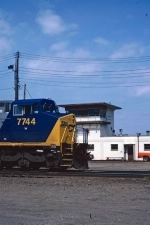 Description: The crew for #40 gets their power on their train as they pass the tower. Description: Train 40 grinds up Byron Hill nearing the Cty F overpass near the top of the hill. Description: Train 40 grinds up Byron Hill passing under the Cty F overpass near the top of the hill. Description: Train 40 grinds past Byron West and a meet with #43. Description: CSX C40-8W 7744 leading CSX 7784 northbound through the yard at Manchester, Ga. Exact date of photo unknown. 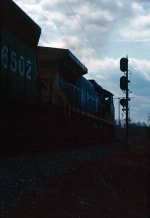 Description: Q-108 slows to a stop to open the connecting switch to the NYS&W and entrance into Little Ferry yard. Description: A good ol dirty engine. Description: The second unit on 213. 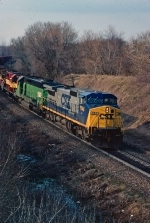 Description: Q118 is in dynamics as they slow down to a crawl before picking up a pilot for the NYSW yard. Description: CSX Q581-10 is the 2nd out of 3 southbound that Q210-10 has to wait on.